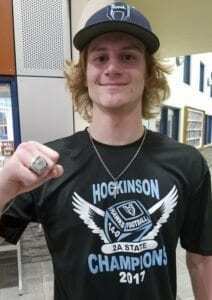 HOCKINSON — Bring the bling. The Hockinson Hawks dazzled during their perfect football season in 2017, winning the program’s first state championship. After two delays due to weather, the Hawks picked up their state championship rings, putting a nice, finishing touch to their 14-0 campaign, and giving the team one more reason to get together to celebrate. Hockinson coach Rick Steele, who has grown back his mustache after his players shaved it off during a December celebration, was all smiles as he watched his players slip on their rings. David Schnieder of Jostens presented the players and coaches with the jewelry. The ring is made of white lustrium and the “diamond” look comes from cubic zirconia. An ‘H’ in school colors is the centerpiece. The state trophy is on one side, the player’s name and number, with a football helmet, is on the other side. Inside the ring is the inscription: Family Forever. “We’re fond of the ‘H’,” Steele said. The ring ceremony — OK, it was not really a ceremony, just walk up to the table and pick up the ring — was originally scheduled for last week. Then rescheduled and rescheduled again after a couple of snow days. “They had to wait, and it wasn’t a patient wait,” Steele said. Monday, the Hawks got their individual prizes for the ultimate team victory.